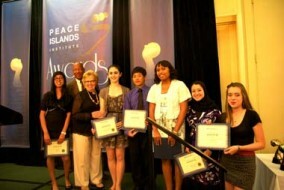 The Peace Islands Institute Art and Essay Contest award ceremony was held at the Hilton Hasbrouck Heights on Sunday, June 3rd, 2012. This year's theme was "Poverty: Time to Act Together". Students from different schools all over NJ came together on this wonderful night and winning students were given their awards and certificates during the ceremony.